The world’s biggest automotive supply chain trade show, Automechanika, is coming to Birmingham for the first time next year - in a move hailed as a huge vote of confidence in the UK’s flourishing motor industry. Automechanika Birmingham will see hundreds of automotive supply and aftermarket companies mingle with buyers from all over the world at the NEC from June 7-9 2016. The event has been made possible through a partnership between the automotive trade body the Society of Motor Manufacturers and Traders and the world’s biggest trade show organiser Messe Frankfurt. There are 15 Automechanika events held around the world each year, with the biggest taking place in Frankfurt, and this is the first time one has come to the UK. It is expected to play host to around 250 exhibiting companies and 5,000 trade visitors. The SMMT said bringing the show to Birmingham will give UK companies a perfect opportunity to attract new business from abroad as well as take advantage of an estimated £4 billion worth of business that is up for grabs domestically. British cars are being made with an ever-increasing proportion of domestically-sourced parts but UK companies in the automotive supply chain are still missing out on £4 billion of potential business each year. The rise of the UK supply chain and the opportunities it has yet to capitalise on were highlighted in an Automotive Council report ‘Growing the Automotive Supply Chain – The Opportunity Ahead’ published in March. The report revealed domestic component makers, many of whom are based in the Midlands, sold 19 per cent more products to UK vehicle producers in 2014 than they did in 2013. But the report also identified a further £4 billion-per-year opportunity for UK automotive suppliers to expand their business in the coming years. Currently around a third of the components in a UK-built car are domestically sourced, compared to more than 90 per cent in the mid-1970s when the industry was at its height. The opportunities for suppliers to increase their output comes as vehicle manufacturing in the UK is enjoying rapid growth. 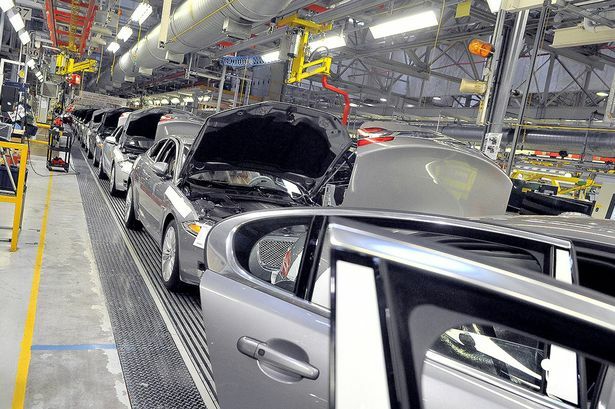 British car production has increased by more than 50 per cent since 2009, with Midland manufacturers like Jaguar Land Rover leading the way. Bentley in Crewe has also expanded its operations, while volume Japanese manufacturers Nissan, Honda and Toyota have seen production soar at their factories in Sunderland, Swindon and Burnaston. Speaking about Automechanika coming to the Midlands, an SMMT spokesman told the Post: “This is a great vote of confidence in the sector and a real boost to the Midlands automotive industry. “Heavy investment is being made by JLR, the latest of which is £600 million being invested in Whitley and Castle Bromwich. “Given their recent investment, the opportunities for local supply chain companies are vast and increasing. “Automotive suppliers growing their business is a real focus of the UK automotive industry at the moment. “An average of less than 40 per cent of the parts in UK-built vehicles are made in the UK. “That is something that is a real challenge for the industry but something which Automechanika coming to Birmingham will help. He added: Opportunities at the moment are huge in terms of growing vehicle production and the heavy investment being made in UK vehicle manufacturing. Detlef Braun, Messe Frankfurt’s member of the executive board, said: “This is the first event in the company’s successful history of international development to be held by Messe Frankfurt in the United Kingdom. A total of 1,528,148 cars were manufactured in the UK in 2014 – a 1.2 per cent increase on the previous year. The UK automotive industry accounts for turnover of more than £64 billion and £12 billion value added. More than 160,000 people are employed directly in manufacturing and in excess of 770,000 across the wider automotive industry. The industry accounts for 10 per cent of total UK goods exports and invests £1.9 billion each year in R&D. More than 30 manufacturers build over 70 models in the UK supported by around 2,500 component providers.